Our pricing is transparent with no hidden extras. An invoice is sent after the work is complete for ultimate peace of mind for our customers. We understand that plumbing and heating can be an inconvenience, especially when it’s a repair or an unplanned maintenance issue. To help reduce the expense we provide a discounted hourly rate. However, you can opt to have a fixed price if you prefer. Please see terms and conditions below. Please see our fixed prices for standard plumbing and heating services. A discount will be applied if services are block booked for the same day and the services are within 2 mile radius of each other. Perfect for those that can co-ordinate their friends or neighbours having services done at the same time, or landlords or letting agents that manage several properties in the same area. Purchasing a new boiler is as easy as with our easy finance options. We’ll even give you £300 off for your old boiler and up to 10 years parts and labour boiler guarantee. At Heppelthwaite the Red Van Plumbers, we rely on the repeat business and recommendations of satisfied customers. It is therefore vital that we charge correctly and fairly for the work we undertake. We consistently monitor our pricing to ensure we offer great value to our customers. Our business is founded on our reputation as an honest and reputable company. Our large repeat client base is testament to the trust customers place in our service. For peace of mind all work undertaken will come with a full 30 day labour and one year parts guarantee. 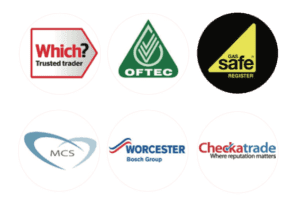 Any manufacturers’ warranties will be passed on to the customer and as accredited installers any new boiler installation will come with a full 7 year manufacturers warranty. Any reported fault resulting from work we have undertaken, and that occurs within the guarantee period will be treated as a priority and dealt with at the customers earliest convenience. We are fully insured with £10,000,000 public and product liability and £2,000,000 professional indemnity. If you have any concerns, require further information or are not completely satisfied with the work undertaken by Heppelthwaite then please contact us. Your concerns will be dealt with as a priority by senior management, who will also welcome any feedback you have on our service. Minimum charge of 1 hour on any job. Thereafter charged in 1/2 hour increments. Within the first hour we will complete the work or advise the customer if it looks like it will take longer. Whenever possible we will provide a “fixed price quotation” for works that require parts or additional time. When this is not possible we will provide an estimate. No call out charge. All time unused from the first hour rolls onto the return visit. For example, if we’re at the property for 15 minutes and need to return on another day, then the remaining 45mins will be used on that return visit. Collection of materials on the day will be charged at a maximum of 30mins unless otherwise agreed. All other charges are based on the time at the property. An invoice will be posted or e-mailed once the works are complete. All charges exclude VAT at the current rate (20%). Jobs exceeding 1 hour will have discounts applied. Time spent diagnosing a fault is part of the service and is chargeable. To provide further piece of mind we offer a Fixed Price Guarantee. For example, if our engineer diagnoses a fault and advises that you require a new part, where possible we will provide a fixed price guarantee to the works. For standard services we take payment after the work is complete. An invoice with a full break down of the work undertaken, which includes labour and any parts used will be provided. Our engineers won’t take payment on the day unless requested to do so by the customer.